King William Street has a new Mexican restaurant to celebrate, The Mule. The latest culinary adventure from the dynamic duo of Erin Dunham and Matt Kershaw of Rapscallion Rogue Eatery, Two Black Sheep, the Alex in Burlington and two other Ottawa Street dining establishments was successfully crowdfunded last year. Having raised over $100,000 with the campaign, the restaurant’s opening was eagerly anticipated. Supercrawl was the official launch, capitalizing on the crowds coming to celebrate the three day annual celebration of music, art, culture and food. The space is open and lively. 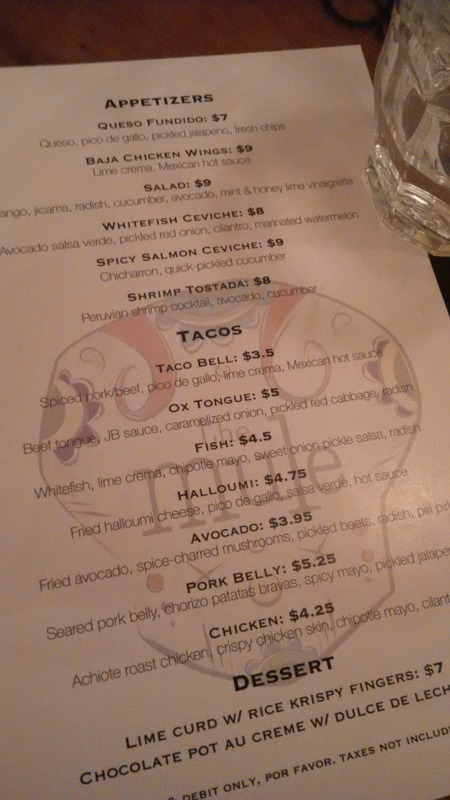 We tried a few things on the menu, the shrimp tostadas, fish, pork belly and chicken tacos. All were delicious and super flavourful. The Three Amigos playing on the screens! Having been coaxed into trying one of the two dessert offerings by our friendly server, we decided to try the Chocolate Pot au Creme with Dulce De Leche sauce….amazing. Absolutely nothing was left in the jar by the end. Give The Mule a try….you won’t be disappointed! Previous Lake Road Restaurant on James St. N.